Early this year, I announced that my husband had taken a promotion with his company and we were relocating from Dallas, Texas and moving to Vancouver, Washington and building a home. There is no more moving every couple of years for our family! We are settling down as promised and staying put. Three weeks ago we finally moved into our home on “Tall Trees Lane”, as we’ve nicknamed it, and today I am finally doing our first reveal. 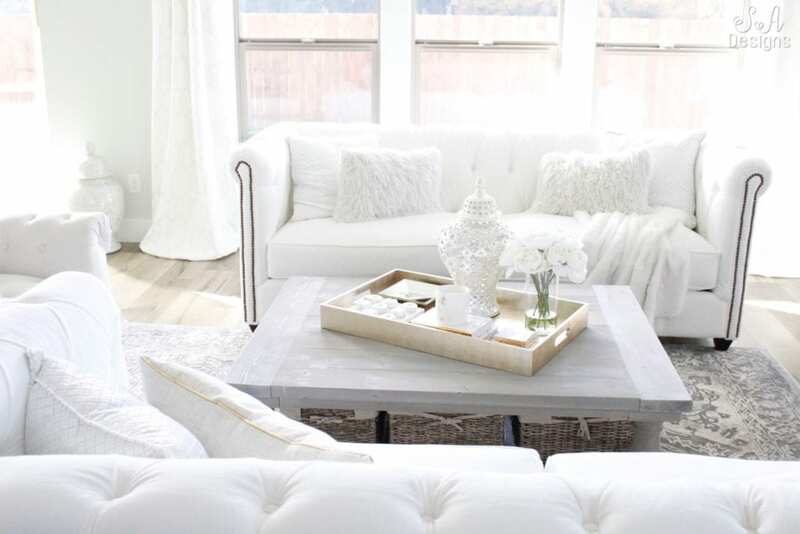 So come on in as I welcome you to our bright white living room! 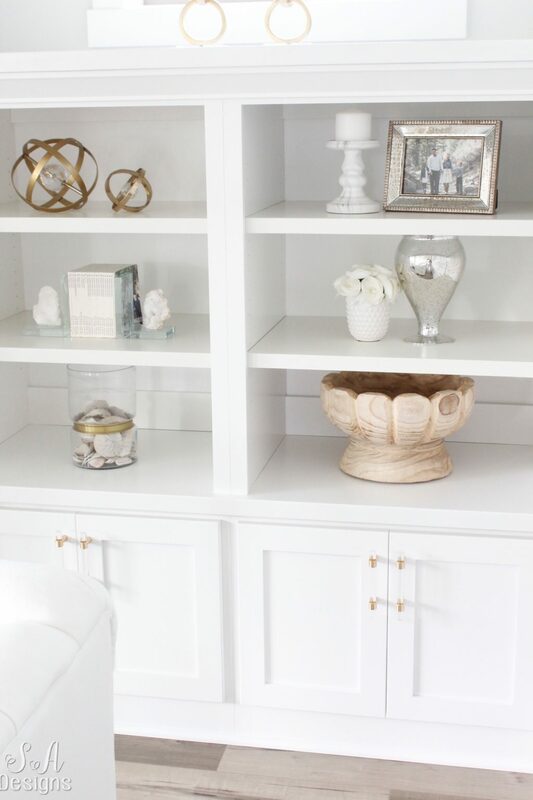 If you haven’t seen my post yet on our Interior Paint Color or the one on our Hardware I Chose, make sure to read them. I also talk about the flooring I chose. 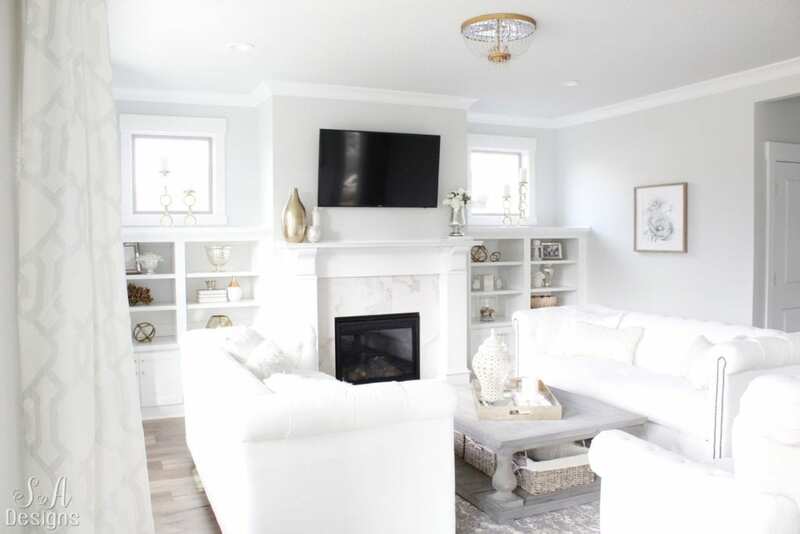 If you’ve followed me for a while, you know my affinity for a bright white home, as I write the “Bright White Home Series“, so my home was going to be just that. 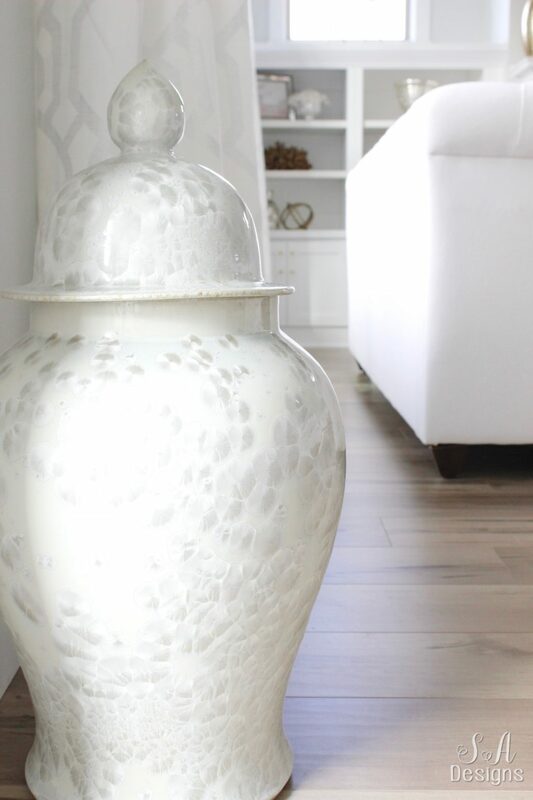 This pretty Large Crystal Shell Jar was such a pretty addition to the corner of this room. Downstairs, I’ve used all brass hardware and lighting. 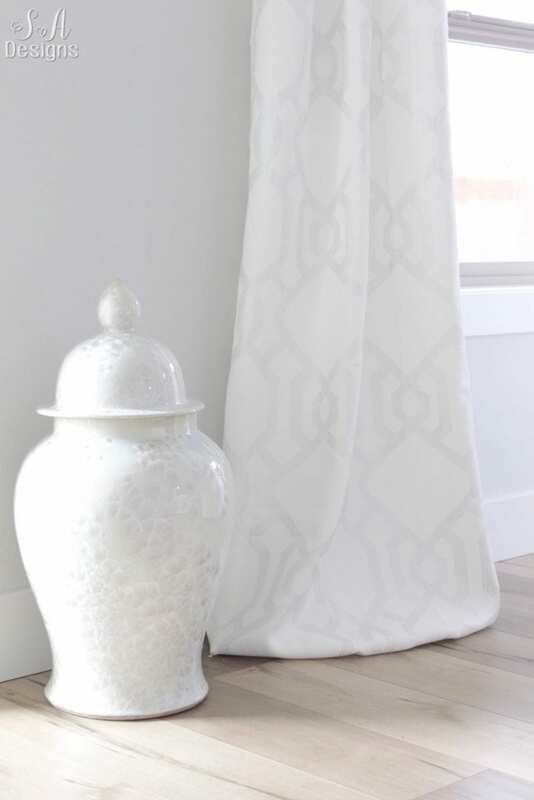 I really love these warm gold curtain rods. 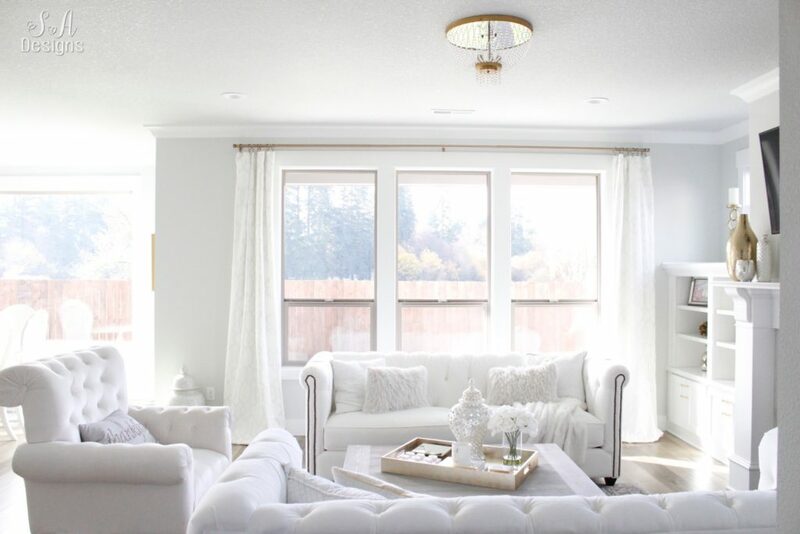 Deciding on curtains in this room was the hardest decision of this entire home. It sounds silly but it’s true. I ordered at least a half dozen different window treatments and none of them worked or looked just right. 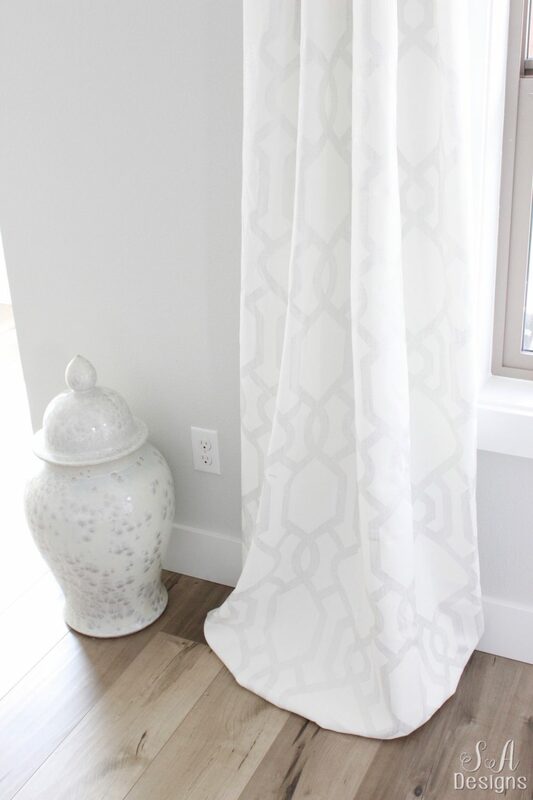 But in the end, I knew I needed some shimmery white panels with geometric design and I knew I wanted them to puddle. I just adore puddling curtains. …Built-ins! There was no questions about them. I knew we had to do them and they were worth the upgrade. You don’t want to do them later or yourself. You don’t want to do an IKEA hack….no! You want to hire someone who is qualified and who will do an excellent job. We have a “smurf tube” that goes from behind the TV and down to the bottom cabinet, where you’ll find our media. It’s not only great for storage, but it’s also fun to style. I just love having these windows above our built-ins to allow more light in. 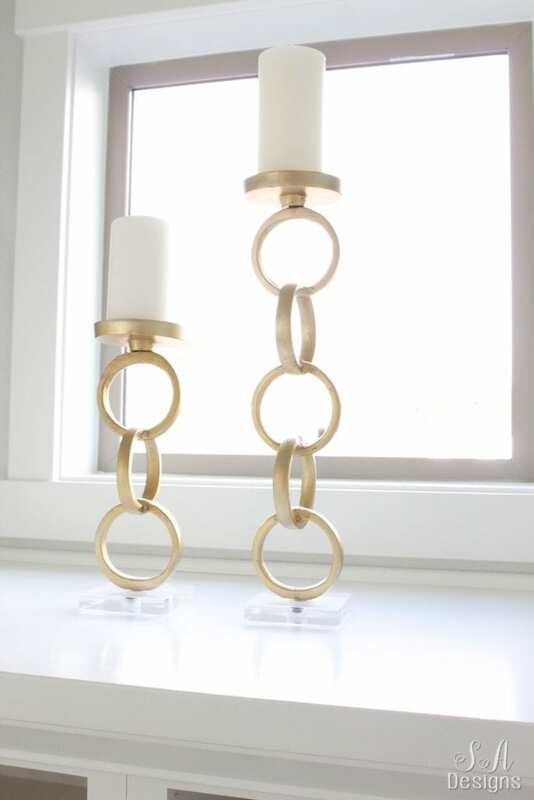 I tried putting many different things on top of the built-ins but a pair of these gold link and acrylic candlesticks on each side won my heart. I didn’t want anything to block the light passing through. 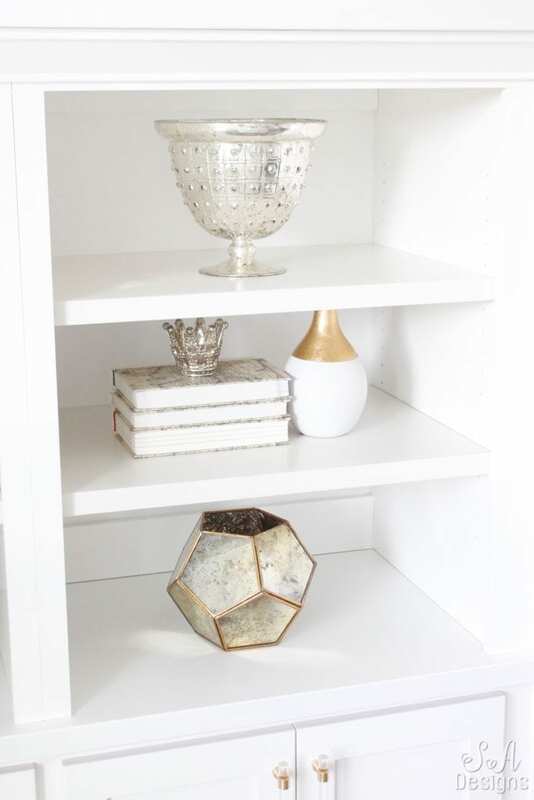 I’ve used a mixture of elements with mercury glass, brass and gold, marble, lucite, and wood. 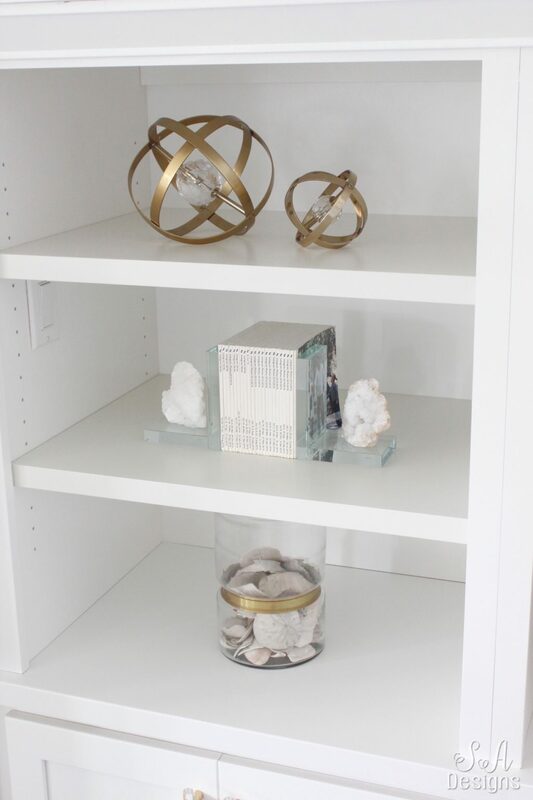 We kept it simple, not overstyled or too full on each shelf, and we added personal pieces like the jar of shells and sand dollars that we’ve collected this summer. Another important was lighting. We have a very open concept floor plan downstairs. The kitchen, dining, and living rooms all connect so the lighting had to flow well. They didn’t have to match, but they needed the same elements. When I reveal my dining and kitchen in the coming days, you’ll see what I mean. 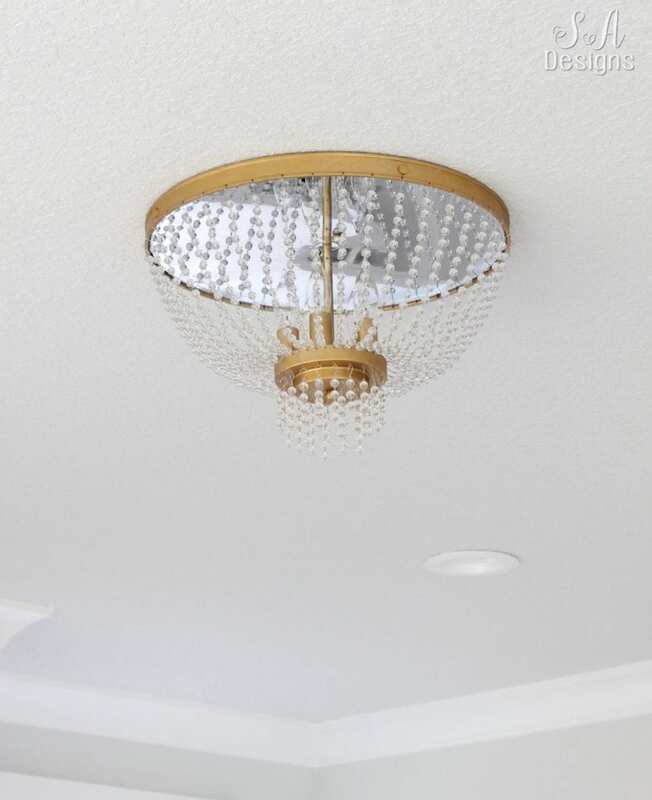 This semi-flushmount crystal chandelier was a beautiful and perfect choice for this space. With this light, we’re able to watch TV from the kitchen and not be distracted by it or have to look around it. 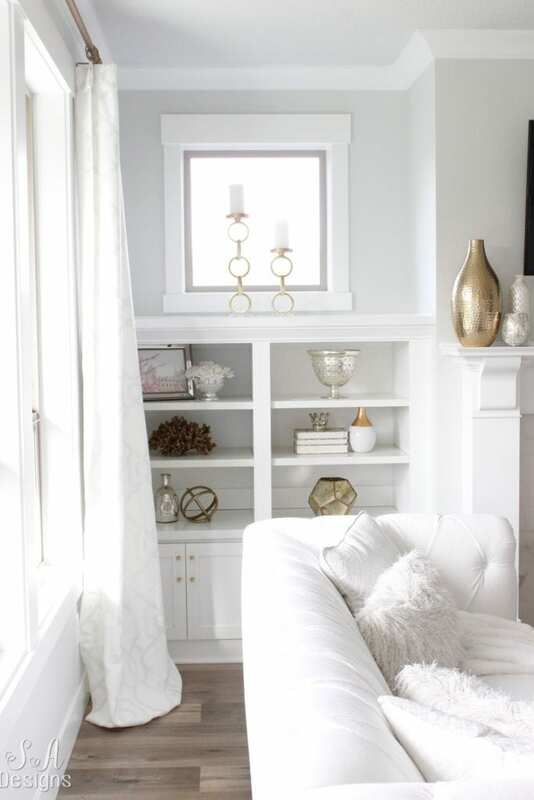 The brass and crystal beading are just the perfect “jewelry” on this room. Remember this coffee table? Yep, it came with us from Dallas. We sold a lot of our furniture but not this piece. We loved it so much that we kept it. It’s perfect for baskets and storage underneath and I love how this gold tray looks on top. 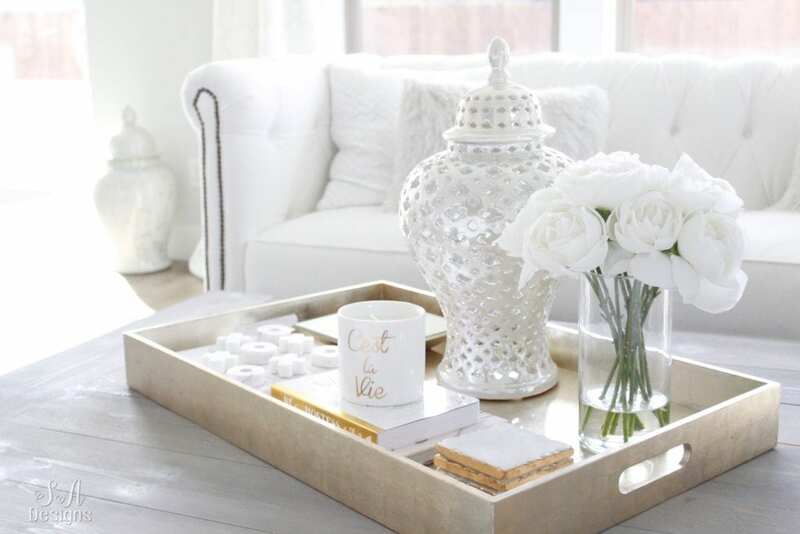 I love styling a coffee table, don’t you?! I keep some of my favorite coffee table books here. 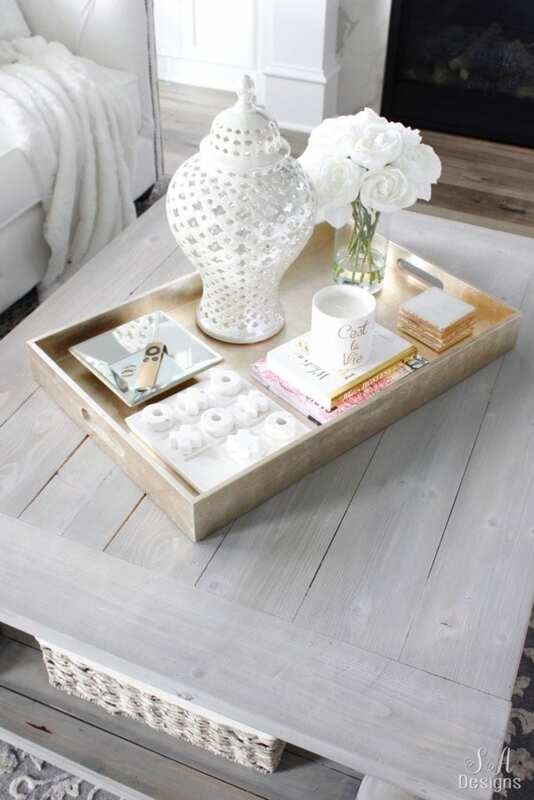 I also keep a pretty tray for remotes and jewelry I’ll take off and get comfy. 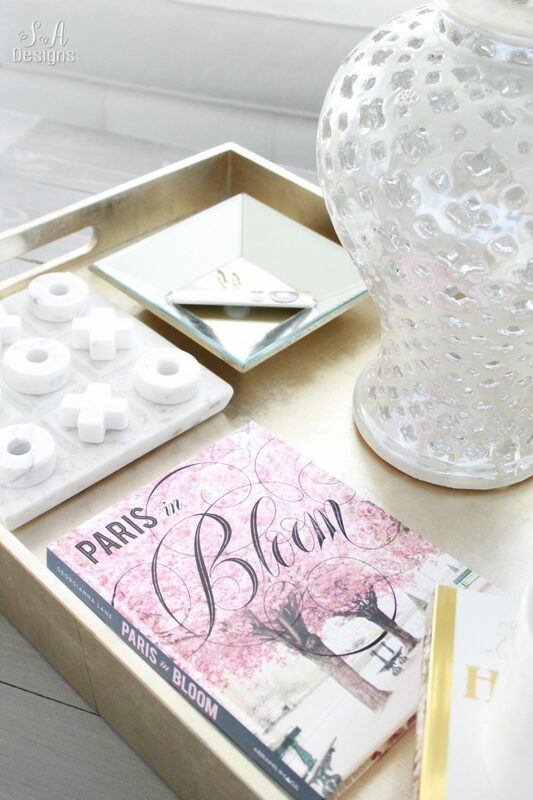 A fun game, pretty things like the jar and flowers, coasters, and a candle. It’s the perfect mix of everything that you should have on your coffee table. Another place I like to keep a couple of fun coffee table books is stacked under a beautiful vase on my mantel. 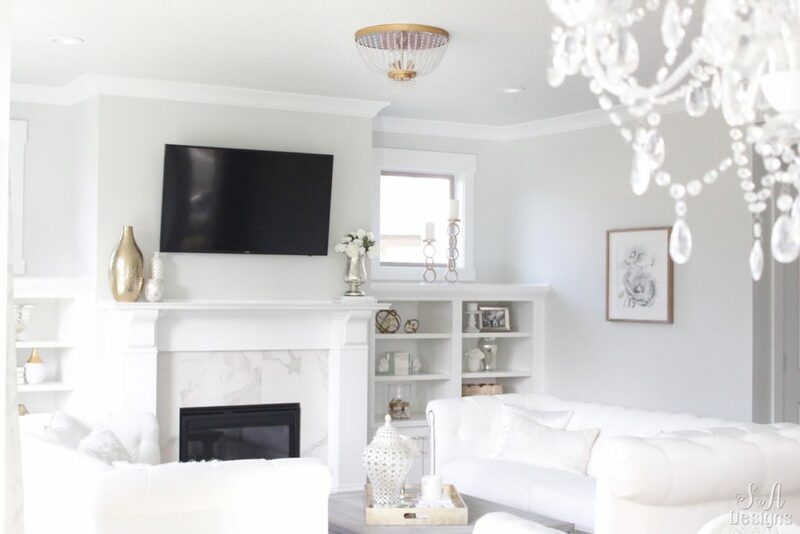 A few years ago while we lived in Vegas, I wrote a blog post on putting a TV above your mantel. 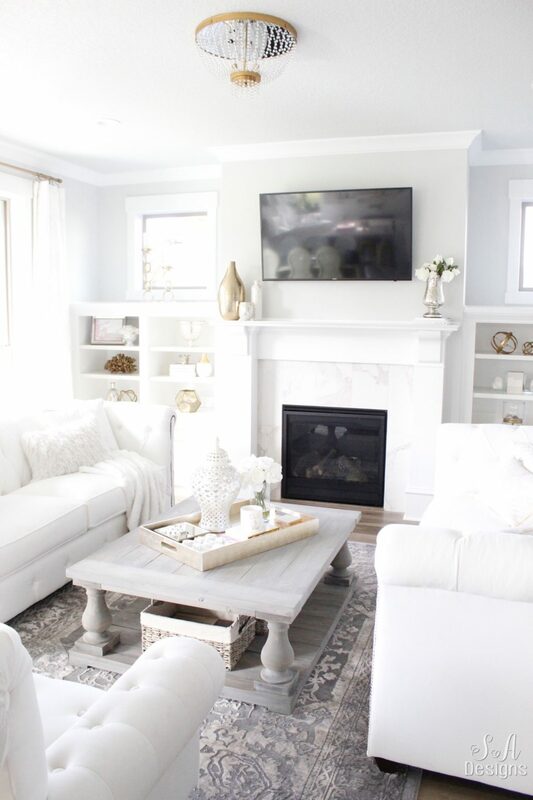 It’s full of good ideas and can be helpful when deciding how to style around your television. I chose a french mantel design without an arch and chose marble tile around the fireplace. I’m so pleased without how it turned out. That touch of marble is perfect. I don’t like a lot on my mantel but instead just a few beautiful statement pieces. 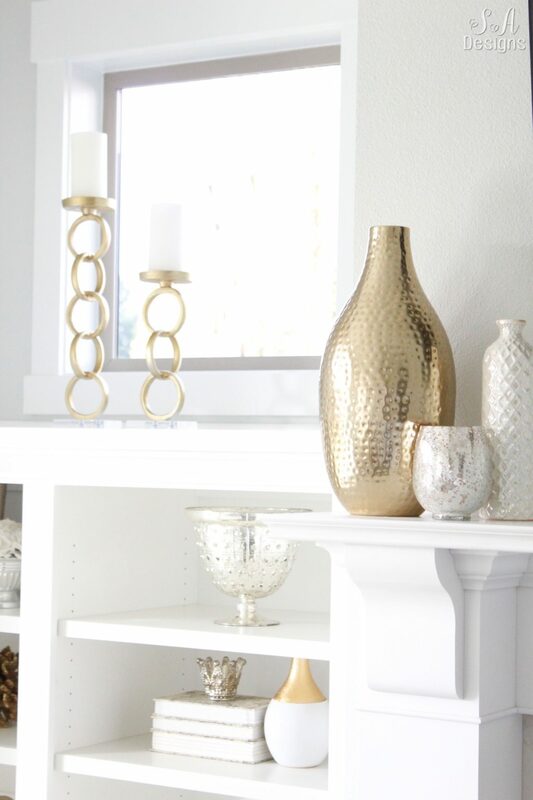 These 2 vases and candle include several of the elements I’m using in this room. I love things in 3’s and in different heights, textures and colors. I shared a peek of this rug in a previous post HERE. I finally got to bring it into our new home and I love it. 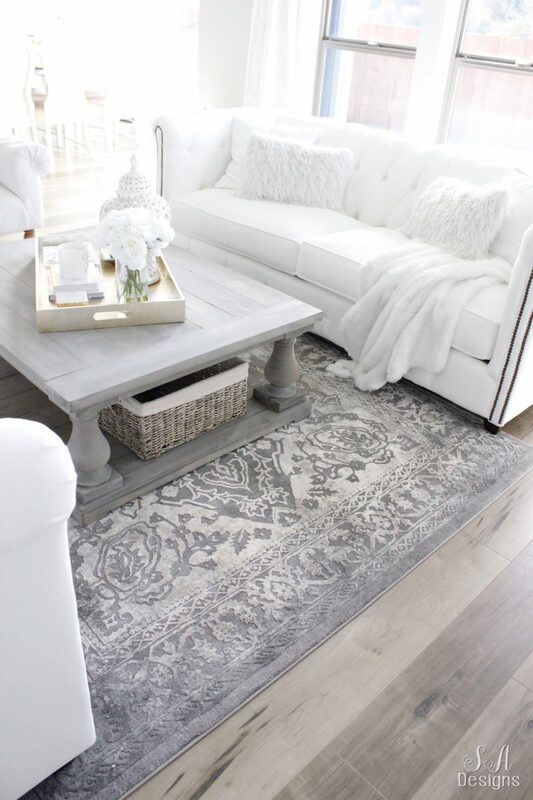 This rug is from Boutique Rugs. When they wanted to provide me with a rug for this room, I knew right away which one would be perfect and the Tibetan TBT-2300 was it. I originally wanted something lighter but with it being winter and Giorgio (our Yorkie) running inside with semi-wet paws and fur, this darker gray won’t show any dirt or water or signs of traffic. The quality is superb! I’m so thrilled with it! 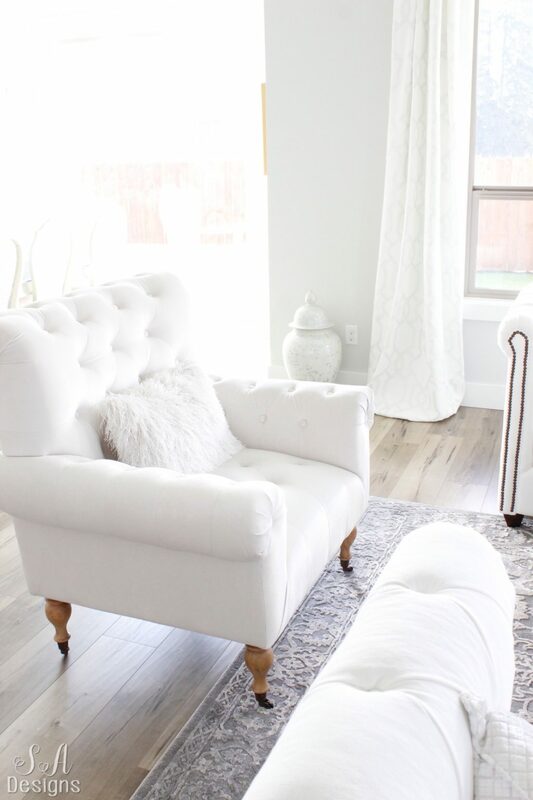 Since I recently purchased this chair before or move from Dallas and fell in love with it, it also got to come with us and go into storage for 6 months until our home was finished being built. It is so comfortable! It’s the Carpe Diem chair by Magnolia Home. Do you see those trees in the background? That is all around us and why we nicknamed this home “Tall Trees Lane”. Our backyard is somewhat shallow but the sides are large and I can’t wait for spring to come so I can get my hands on that backyard and plant so many things and do the landscaping. So many pretty plants and flowers grow well here in the Pacific Northwest and it’s going to be so fun! 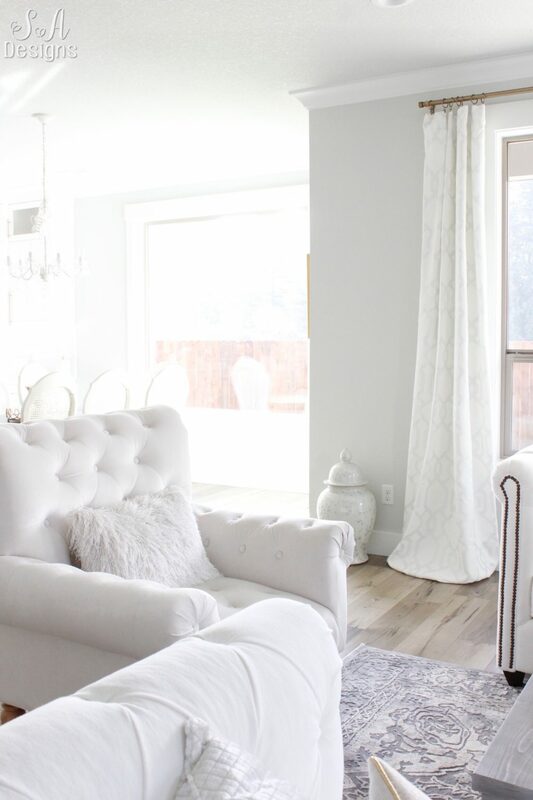 Now, on to my favorite part of the room (besides all the windows)….these sofas! 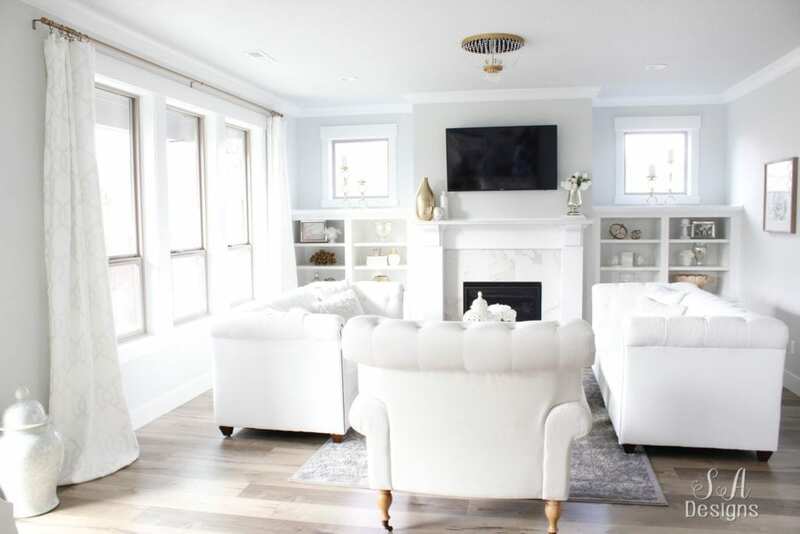 I was so pleased that my friends at Joss & Main wanted to send me these 2 Josephine Tufted Sofas in Classic Bleach White. I’ve had my eye on them and crossed my fingers that they’d be as beautiful in person as they were online. And they were!!! They arrived without any damage and as I opened them I gasped! The tufting was beautiful and the nailhead trim on the sides and dark feet were such lovely traditional details. This color, “Classic Bleach White” was the perfect color. It’s stunning and so is the tufting. It was the prettiest white but had no blue tint to it. 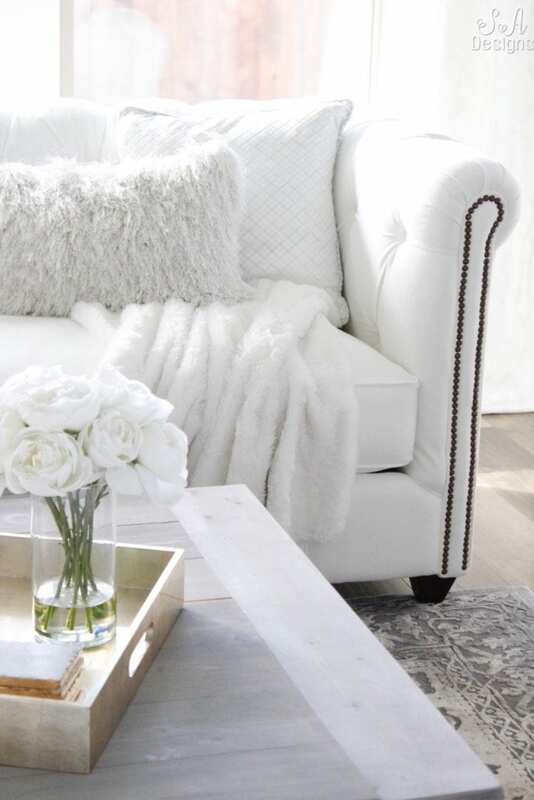 It looks gorgeous with both white and ivory pillows and throws. The quality was extremely impressive and when I tell my friends the price, their jaw is on the floor. One friend said they were expecting these sofas to be over three thousand a piece and from some high-end furniture store. And they’re so comfortable. Every cushion is full and evenly stuffed. They come with 2 plush pillows per sofa but I used my own decorative throw pillows. Yes, we sit on them EVERY day! We’ve had them for over 2 weeks and there is not a single mark on them. We’ve kept them clean. 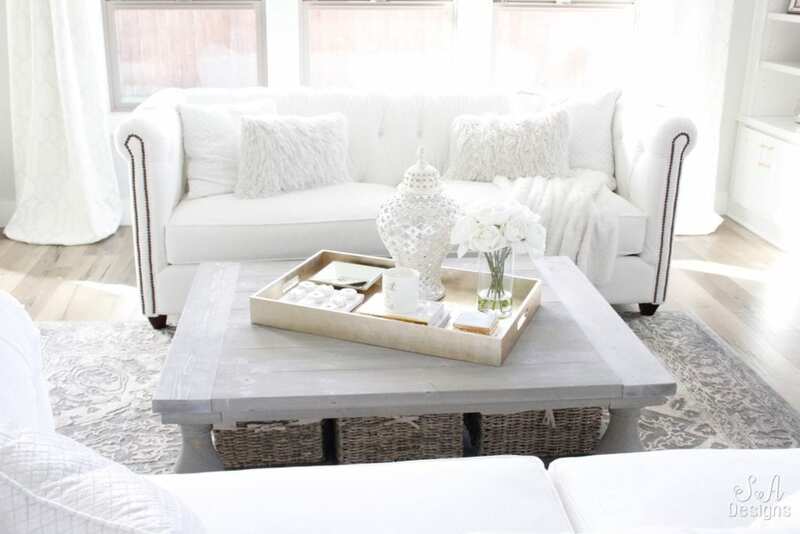 I know….you’re going to ask me how to have kids and white furniture. We’ve done it before and we’re doing it again. Our little dog, Giorgio, is not allowed them. He has his bed on the floor next to our sofas. We don’t allow food out of the kitchen. Our kids must wash their hands when they get home from school (and face if needed) and they need to change if their clothes are dirty or wet. It’s not hard. You just have to follow through and make sure the entire family follows the rules. I’m confident that these gorgeous sofas will stay clean. And if not, you can spot-clean the sofas. I was referred to another blogger with the same fabric and color but a different sofa. She couldn’t say enough about how much she and her family loved the sofas and about how easy the fabric was to clean. Her children are much younger than mine. I felt good about my decision and proceeded to order the sofas. Everyone in our family loves them and we’re thrilled with our choice. 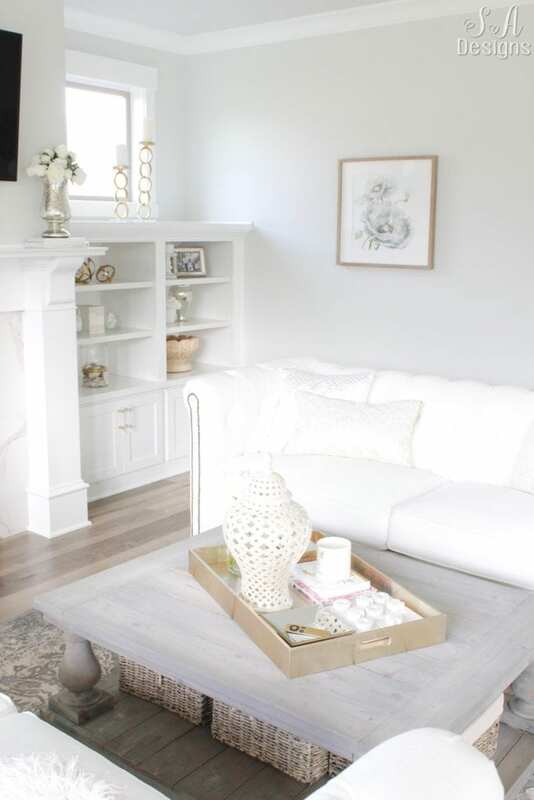 This bright white living room has been such a lovely place to welcome guests into our home and I am so pleased with how it turned out. 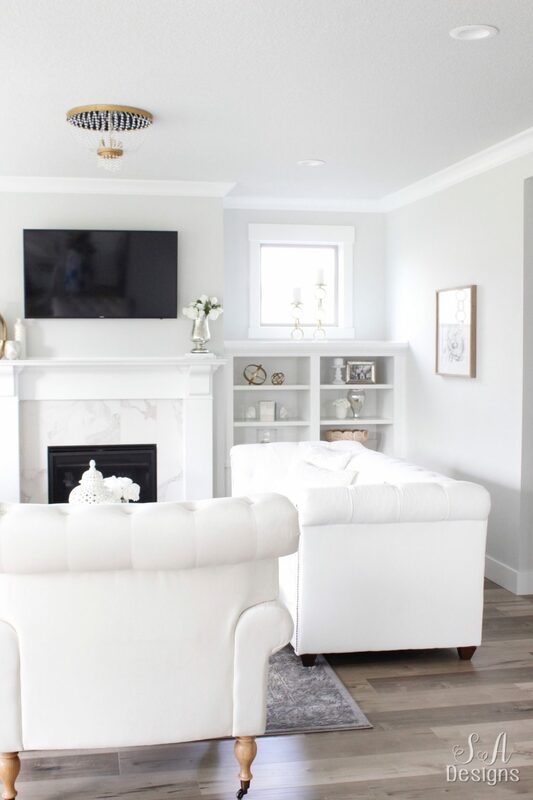 As you’ll also see in my kitchen that I’ll be sharing this week, I chose to design this bright white home because we will be having many gloomy cloudy days here in the Pacific Northwest. 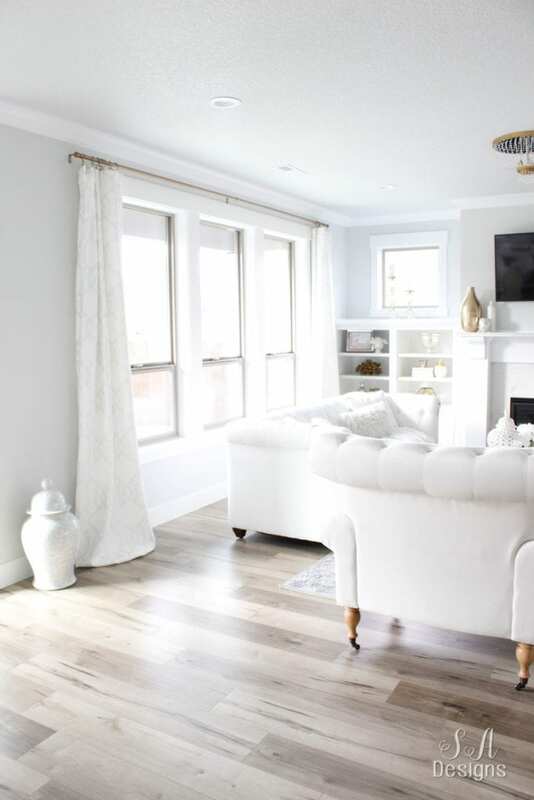 Walking into a bright white home helps combat any gloomy days and will be a place of refuge as we adjust to this very different climate. We aren’t in Texas anymore, ha! Thanks so much for stopping by today and I can’t wait to share more of our bright white home on “Tall Trees Lane” with you! I’m including my affiliate shopping links for you below, for your convenience. I am just dying over this room! I love what you said… The lighting is like the jewelry to the home. It’s so is with this home. And those couches! I want them in my life! Okay and the rug too. That’s fantastic! Summer this is so perfect!!! I love how you displayed your chat books. Totally gonna copy you! It’s gorgeous! I can’t wait to get a peek at the chandelier I saw in one of the pictures! I’m on the hunt for one now. Beautiful job, Summer! Awww thanks sooooo much, Shannon!!! You’re always so good to me. I’ll be sharing my kitchen in just a couple of days so sit tight! Can’t wait to show you! Hugs!!! More lovely than I imagined. You have impeccable taste. Thanks for the insight into your new home on Tall Trees Lane! Just stop it right now Summer! It is Sooooo beautiful! Love all of your choices!! 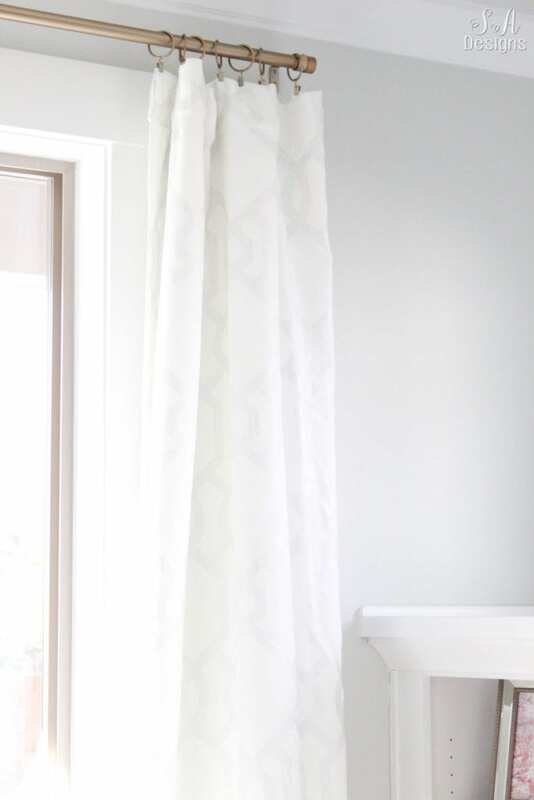 I can’t believe you have drapes already! I’ve been looking for months but haven’t pulled the trigger on any!! I am so happy and thrilled for you! You did amazing my friend! OMG Summer!!!!! I am dying over all the gorgeousness!!! I honestly don’t think I could be any more pretty can’t wait to come visit some day (soon) and see what you’ve done to the rest of the house!!!! Such a magnificent and beautiful room! You’ve done an incredible job in such a short time. I’m totally honored that my book is there and one of the spots of color! Thank you, dear, and so happy for you!!! Oh Georgianna, that means the world to me! Thank you, dear friend! 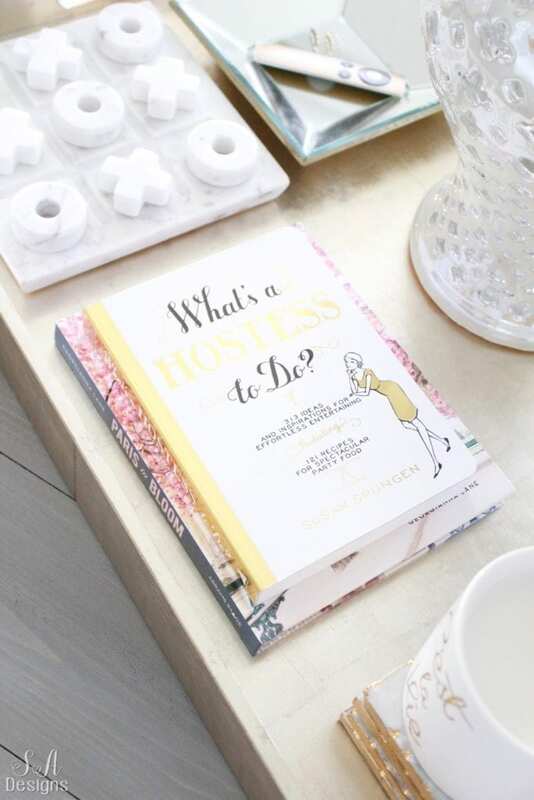 Your book(s) will always have a place on my coffee tables or shelves. They are a delight and I’m honored and thrilled to have them and share them with friends. Thanks so much for stopping by. Big hugs to you! 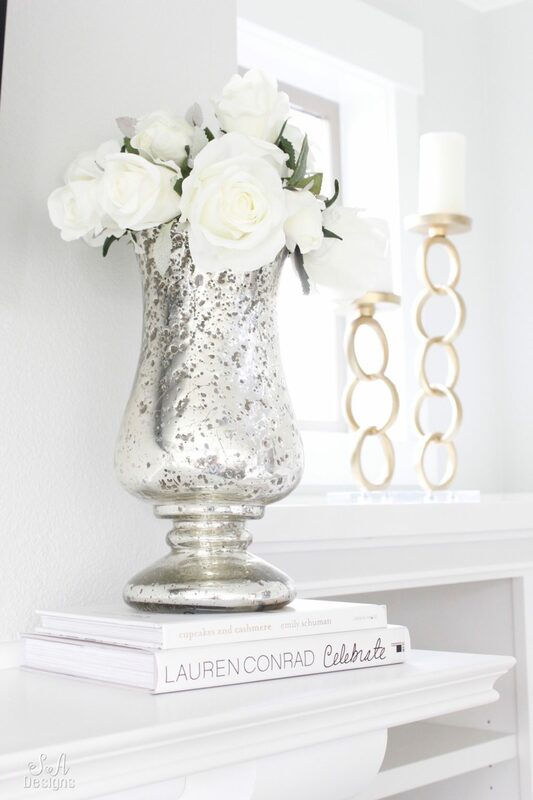 Where did buy the marble candle holder? Hi Vanessa! It was from Bath & Body Works earlier this spring. So beautiful summer! So excited for you! I love color so white has never been my thing but I had a big move and am in a dark house… heavily wooded lot which I lovebut not much light. So I, like you, need a bright pick me up inside. I am a single parent of 3 with two in college so I appreciate your inclusion of some more affordable ideas as my budget is challenging! Sofas are my favorite! Enjoy your beautiful home. Gorgeous Summer!!! Every detail is beautiful! So happy for you!!! Thanks soooo much, Lisa! I’m so glad you stopped by! 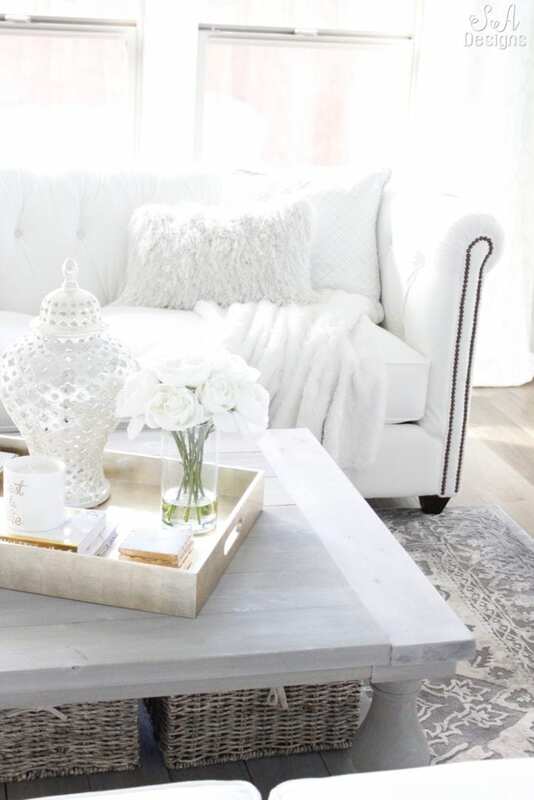 Love your style and your house is beyond beautiful!